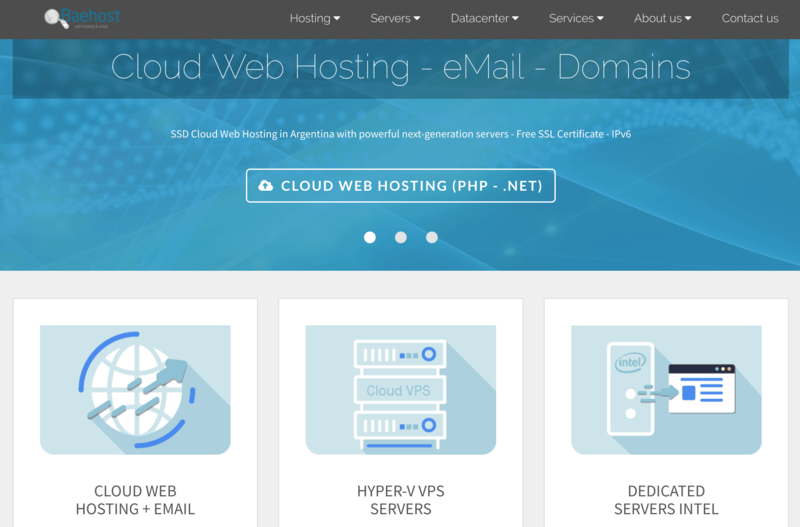 Baehost Review 2019: Is Baehost a Good Hosting? Baehost boasts more than sixteen years in business, servers in multiple Argentinian and international data centers, and excellent uptime backed by a service level agreement. Baehost resulted from the merger of website hosting providers LPDNET and HTTPPROVIDER in 2002. They use multiple data center locations in Argentina and around the world, and as one of the leading Argentinian providers, they have excellent customer service and great infrastructure. Their website and support are available in English and Spanish. Baehost offers a full range of website hosting services for beginners and experts. Their services include shared website hosting, corporate website hosting, free hosting, reseller hosting, dedicated hosting, plus SSL certificates and domain registration. Baehost’s infrastructure is top notch. Not only do they have servers located in Tier II and Tier III multiple Argentinian data centers, but they also are fully IPv6 ready and use RAID 10 SSD storage. They boast uptime of over 99.99% backed by a service level agreement that is fully outlined in their detailed terms and conditions. Whilst it is not obvious from their website, they do have some nice features for beginners. After diving into the website package specifications, I noted a very beginner-friendly WordPress Toolkit plus more than 400 programs that can be installed with one click. They also have some value-adds for experts including PHP 7.2, optional PHP or .NET, remote access, SSH, and FTP access. Baehost’s pricing is great. Their packages are well priced when compared to local and international companies, and they also include many features in the base package (e.g. domain registration and SSL certificates) that you would have to pay extra for elsewhere. There are four contract lengths: monthly, quarterly, semi-annually and annually. It’s very convenient that they offer both a no-obligation monthly plan and a deeply discounted long-term plan, plus a 12-day free trial. All prices are listed in United States Dollars. With local numbers for Argentina, Chile, Mexico, Brazil, Spain, and the U.S.A., their customer service options are especially suited to a customer base across North and South America. They also offer customer contact via Skype, Whatsapp, email and live chat. Not only do they have a wide variety of contact options, but they also provide 24/7 support and an in-depth knowledge base. I’ve contacted them several times via live chat – both morning and afternoon – and have always received a quick, friendly and informed response. The excellent support is provided in both English and Spanish. Baehost provides professional services at affordable prices. Their services are monitored 24/7, they have an uptime of 99.99%, and their ping time is less than 50ms. Wondering how Baehost stacks up against other Web Hosting companies? Enter any other Web Hosting company and we will give you a side-by-side comparison.